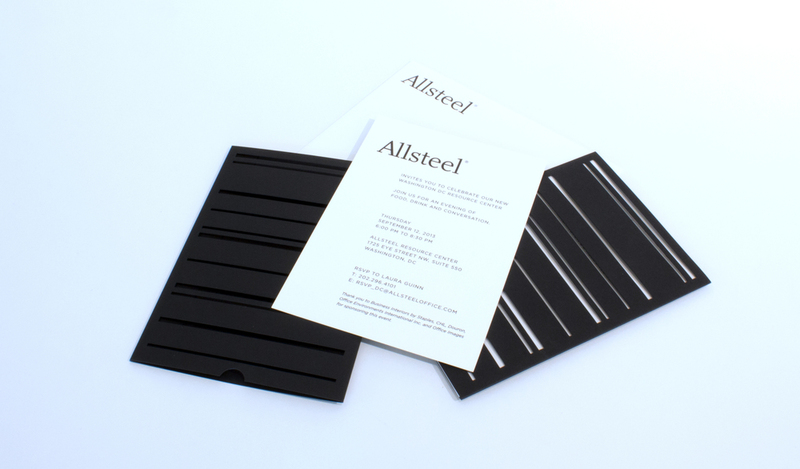 Signage, graphic design and invitation design for Allsteel. Deep in the pages of commercial office furniture history, Allsteel’s start began with the invention of the file cabinet. Allsteel’s new welcoming feature wall captured this idea with illuminated and perforated rolled steel, abstracted to resemble stacks of paper. For their opening celebration, we created an invitation that celebrated this history and teased attendees’ first glimpse of the new space. Hickok Cole Creative delivered signage, super graphics and invitation design to Allsteel.